NES Metal Max (JPN) in 26:09.55 by ECCO. A mysterious war, known as "The Havoc", has almost destroyed the human civilization. How it broke out is unknown, and no one even dare to study about it. The few survivers have to struggle for life, among whom our young hero, E, just makes his decision, to become a great Hunter. 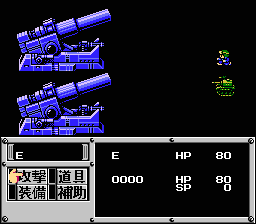 Released by DATA EAST in Japan in 1991, Metal Max was one of the more "creative" role-playing games amongst Console RPGs, due to more freedom on the story. The game is set in a post-apocalyptic future, in which surviving people cluster from villages to ruins, while some Hunters from them fight monsters and outlaws in the "wild". The author abused glitches in the game to complete it achieving the "good ending" in less than half an hour, while normally it is supposed to take more than 10 hours. We recommend reading the author's comments for more details.